Preparing for your Engagement shoot – 3 easy steps in getting the most out of your photo session! Today I wanted to share some info for all of our lovely couples that are now starting into their Engagement sessions for up and coming weddings this year…and next. I have been super busy with Engagement sessions lately, so today I wanted to take a few minutes out to share, what I feel, is some good solid knowledge on just what you need to do in getting prepared for your up and coming E-sessions. Getting your Makeup and Hair done professionally can substantially increase that polished and final look of your images. When paying for professional images, something that you will look back on and treasure years later; You want to make sure you are camera ready. What might look great for basic “day wear” might not translate the same in professional images and different lighting situations. Keep in mind, engagement sessions are often fairly casual, so it’s not about over-doing it. A nice polished and cleaned up version of yourself, not only goes a long way for the photos, but also ups confidence levels and just a good overall “I look and feel good” vibe. Which in turn helps many client’s relax a bit more in front of the camera when they look and feel great. Often we see client’s that try to stretch that buck spent and combine them…truthfully though, this can in many cases, cause more harm than good. Which is why many client’s now a days are opting to do their engagement Makeup and Hair services as a completely separate booking. Remember that E-sessions are generally about you as a couple, candid, loving, a “behind the scenes” if you will. 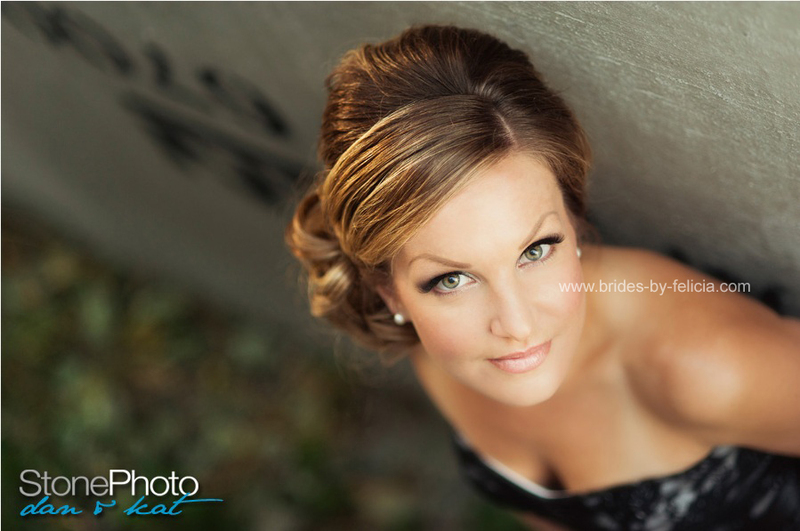 For those opting for more formal Wedding day styling, up do’s, more structured styling, this can and does, in many cases, look very “off” in an engagement session. Especially if you are out in a casual setting, often jeans and a nice Blouse or T-shirt, then rocking a Full ‘wedding day look’ on the upper portion with a styled up-do, big false lashes and so forth. Yes it’s nice, but completely deflects from the casual couple feeling and can look like you are trying way too hard. So use your judgment. Popular looks being done for casual engagement sessions are often soft all over curls or light half-up styling – this helps add movement with a bit of polish without looking to over done. While Makeup is often clean, polished for on-camera, usually sticking with more earthy color palettes as a popular choice amongst many clients. Light lash filler like individuals, or accent lashes, is also a great way to add some focus to your eyes, without looking like you’ve strapped on a pair of night-club false lashes, then went to hang out in a pretty field for some pictures with your fiancé. Don’t forget to clean up your nails and moisturize those hands too – It’s time for some pictures of the rings! Photo courtesy of Amber Hughes Photography. A little more Glam – Photo courtesy of Stone Photo. As mentioned above. Unless you are doing a full-out “theme” shoot. Your outfit choice helps tell the story and compliment the location choices too. Some client’s opt for simple jeans and T-shirt styles, while others might go a bit more glam with a cute dress and suit styling for their fiance…. Whatever makes you comfortable and shows your personal vibe and style. Look at your location choices as well, to help you better determine your clothing options. When picking your outfits, don’t forget about your seasons; colder temperatures vs. warmer! Remember – Clothing can often photograph a bit larger or baggier too, so look at items that are a bit closer to your body for a more flattering look. Avoid items with large logo’s on them as well – You are not doing an ad-campaign! Clean – No old or “pilling” sweaters, etc. Yes they might be your favorite items, but over worn clothing photographs exactly like that = Over worn and old looking! For the Guys, this means looking at new shirts. Something clean, modern, that isn’t that same shirt in the back of the closet that only comes out at the holidays. Colors – Solid colors can make a wonderful impact in images, giving a fun, vibrant and youthful playfulness. Avoid drab colors that will wash you out, causing you to look sick or pale. Also try to avoid anything to “matchy-matchy” with your partner….There is a fine line on looking cute and looking like you are twins. Accessorize – Ladies , your accessories can add polish to your look, but don’t overdo it. Light Layering on items can also make your look a bit more put together. No wrinkles!!! – Break out that iron. Make sure your items are all clean, and ironed. Nothing looks more distracting than a giant wrinkle straight across the front of a dress shirt or cute dress. And lastly, choosing your location. Something that reflects you as a couple. We see everything from full themes – Cosplay, zombies, cherry blossoms, you name it, we’ve probably seen it – So whether you are going for casual or formal, or even themed. Take the time to scope out some location choices beforehand. Speak with your photographer and let them know what you like. We are blessed in our area with a wide range of options whether you like the concrete jungle of the downtown core areas and fancy artisan buildings, to the forested areas and horse farms of the valley, straight through to the quaint older brick neighborhoods, the beaches and ocean, all the way through to snow-covered mountains. Your possibilities are endless here. This doubles over as well as to how and where you might use these images – Will you be using them on save the dates/invites? or displayed at the wedding? If planning this, Your Engagement shoot can then follow similar ideals in order to tie it all in. This will also further help you in determining or bringing with you any pre-made “props” for your engagement session! Look at taking the day off of work and doing your session during the week/day! Not only will your vendors often have far more flexibility with dates, but this can help you further for a number of reasons. Traffic – people are at work. Leaving many locations far more accessible with easier parking options too. Especially any downtown or main areas. Fewer people – Especially in cases of those doing main locations – weekdays often give you far more options for images, with far fewer people in the way or walking around. Areas can often be a bit more personal and romantic feeling because of this. For those that are a bit nervous shooting in public with people staring at you, this to can help ease that a bit. Shooting on a Saturday or Sunday, mid afternoon, no way. Locations – Hotels and Venues – Yes, you can look at scoring some amazing pictures at local venues, but call in advance. Some may cost you, some can be free. Same as with many commercial photo shoots we all do for magazines etc. during the week, these areas are often quiet as can be, and may let you in to shoot a few pictures. This can be a gorgeous option for those looking at something a little bit more than the standard street or field shots for their sessions. When it’s all said and done – why not make a night out of it? You’re dressed up, Makeup and Hair done, and both looking fabulous….look at heading out for a nice romantic dinner.